AFRICAVENIR has partnered with Sercine of Brazil to showcase 10 African short films at the upcoming Festival Sergipe de Audiovisual, which takes place from 19 to 25 July in Sergipe, Brasil. Hans-Christian Mahnke, director of the Namibian section of AfricAvenir, has curated an African Short Film Section at the festival, which will begin in less than a month time. 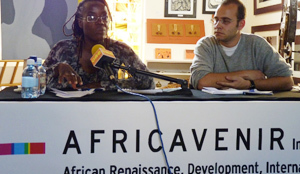 According to a statement by AfricAvenir the partnership aims at getting the Brazilian public to discover a cinema they usually don’t have access to, and attract Brazilian audiences to cinematic products from Africa, relevant to the African rooted Brazilian society. This has been done, to promote audio visual products from Africa. Part of the goals of an African renaissance that is to root African development on the reality and culture of African peoples and to re-invent and re-construct the African continent according to African priorities and values. The overall aim is to contribute to the recovery, rehabilitation and imaginative recreation of African civilisation, culture and history in order to devise new ways of thinking, behaving and organising both the African societies and the emerging HGlobal VillageG. As for the selected films for the Festival Sergipe de Audiovisual in Brazil, they include Namibia s sCries at NightC (directed by Oshosheni Hiveluah) and My Beautiful NightmareM (directed by Perivi Katjavivi). Further films come from Kenya, Zimbabwe, Ethiopia, Uganda, Morocco, Cote d Ivoire, Democratic Republic of Congo /Burkina Faso. See list below. “My Beautiful Nightmare”, directed by Perivi Katjavivi, 12 min, 2012, is a film about a young woman bruised by the city, dreams of escape and the freedom of her childhood. A girl spends her evenings prostituting herself out on the streets of Windhoek. But when a client roughs her up the experience leaves her shaken and forces her to rethink what she’s doing and how far she has come from the sweet little girl she used to be. This UNICEF funded short film depicts the story of Tabitha, an AIDS orphan, who is being taken care off by her aunt, who can’t provide her with a nutritious diet. When Tabitha turns ill, her classmate Tino and her mother show persistance and care for the child. A sad, yet positive, story about the realities of families living with AIDS. Note: Music with and from Plaxedes Wenyika. “The Legend of Ngong Hills“, directed by Kwame Nyong’o, produced by Apes in Space, 10 min, 2011, is a traditional Maasai story, about the creation myth of these magnificent hills that backdrop present day Nairobi. The film turns this oral folktale into an action-packed animated adventure, using an aesthetic based upon the Makonde sculptural style from eastern Kenya. Best Animation Film, African Movie Academy Awards, Lagos, Nigeria, 2012.